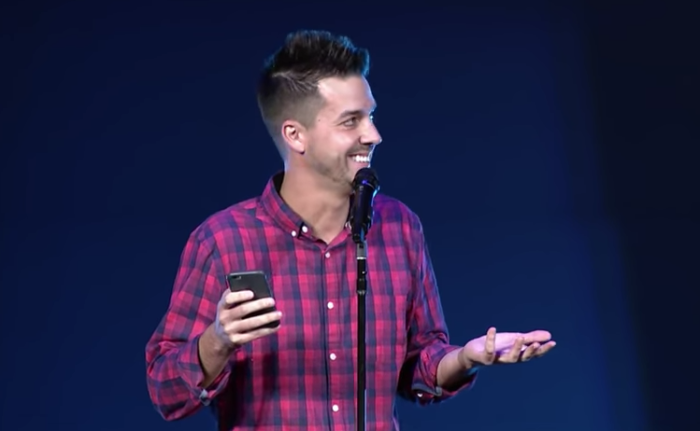 Popular comedian John Crist said some people get offended by his jokes and even go as far as questioning his Christianity. But he believes "sometimes people need to be offended." In a recent interview with The Stream, the 34-year-old performer said he used to follow up with his critics to clarify misunderstandings but "now we don't." "We like people to think for themselves," he said. "If people are offended, that's OK. By all means, voice your view. If I'm allowed to voice my take, so are they. If some millennial is angry and thinks it's not funny, go ahead and post that on my video. I can't spew my opinions for an hour a night and be angry when somebody differs." Crist, who was homeschooled, noted that his "Sponsor a Millennial Today" video offended some millennials and that he also gets flak from homeschoolers. "People who are angry about jokes, they ask, 'Are you a Christian?'" he noted. "Think about it. If I am a Christian, these jokes are hilarious and we can laugh together. But if I'm not, these jokes are now very offensive — making fun of communion or Christian weddings. Truth is, I am a Christian who loves Jesus. I think the local church is our only hope. That being said, we do some weird stuff." Also during the interview, Crist talked about what he feels is the true value of comedy. He described comedy as a kind of "weapon" that can be used to combat sadness and depression, two things that are becoming more prevalent these days. Crist also reflected on some of his experiences performing in front of people at Alcoholic Anonymous meetings, crisis pregnancy centers, homeless shelters and prisons. Crist called those "the best shows" and said audiences at those shows aren't going to get offended easily and are instead looking for reasons to laugh. He added, "People in those places have often felt the deepest and realest pain. Sometimes we middle-class Christian people just need to loosen up." Crist is touring the country over the next few months with his comedy. Most of his shows are sold out, according to his website.